Ashru, Sweth, Rakta se lathpat lathpat lathpat..
Wow! Lines of Shri Harivansh Rai Bachchan has created magic. Once? No. Twice! This time in a different way. Agneepath (1990) to begin with, is remembered majorly for Mr Amitabh Bachchan as Vijay Deenanath Chauhan. 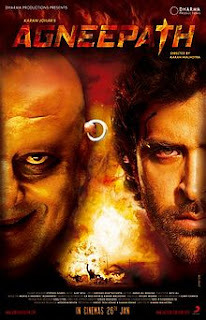 Agneepath (2012), however, will be remembered for Sanjay Datt as Kancha Cheena and Rishi Kapoor as Rauf Lala. Karan Johar, has "tried" to remake a commercially average yet classic "Agneepath" but ends up making it a good-to-watch-easy-to-forget film. The reason? Lack of proper treatment. First half of movie, is racy,compelling and entertaining equally, thanks to brilliantly shot sequences, tight screenplay, heart-throbbing background score and power packed performances. Sanjay Datt excels throughout the movie, this is probably his milestone performance. Rishi Kapoor on the other hand, after showing brilliance in Do Dooni Chaar, again proves that a star remains a star! How about Hrithik? Hrithik chooses expressions rather than words. He may not have mass - appealing dialogues but his expressions works like wonder! If you compare Hrithik directly with Amitabh Bachchan, he has, still, done a commendable job. So where this movie lags? Post interval. Movie misses the thrill that it creates prior to interval, slows down its pace to focus on sub plots, which rather adds melodrama that is unneeded. Film seems dragged a bit too. Story, predictable and yet entertaining, somewhere challenges your logic. Climax, which seems to be written for justifying Sanjay's role, is not grand. Music is good, backgroud score is really thrilling. Overall, a deserved watch for sure, but somehow keeps you longing for more. Sanjay Datt, Rishi Kapoor and Hrithik Roshan are outstanding, Om puri fits the bill, Priyanka's character gets sidelined. Deven Bhojani and Zarina Wahab are noteworthy. Katrina Kaif's appearance in Chikni Chameli song adds masala (makers removed the Iyer character to avoid masala factor, crafts new villain Rauf Lala instead, which works too). Predictable story overall, with few twists that actually adds the thrill. Screenplay is engaging and makes an otherwise lengthy movie, a fast paced action-drama. A strong aspect of the film. Ajay - Atul does, less or more, the same job as they did in Singham. Well done! Good in parts, over okay. There is nothing that you haven't seen before, but yet the movie manages to hold attention thanks to performances, music score and splendid DOP. Agneepath, will be a hit this time, for sure! Opening records are likely to be massive and will cruise easily in first week. Well said. I'm not sure why the director put all of the action in the first half and all of the slow, emotional stuff in the second. I couldn't wait for it to end. I see that censor board has goofed up once again. Film has a considerable amount of violence, mild expletives and continuous show of drugs. Films like Shaitan have been given A rating, based on such factors! Extremely Bogus Movie. I know i can't get my money back and i felt cheated. In my view time and dime are not worth for this film.